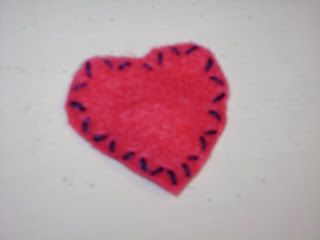 Have I ever mentioned how much I am in L-O-V-E with felt?! Seriously, I love how the edges wont fray...saves SO much work!!!! 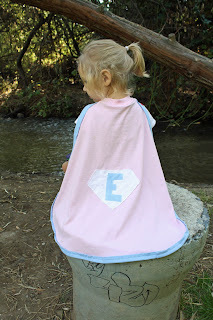 Have I also mentioned how much I absolutely H-A-T-E hand sewing?! It takes so long, and its hard to get the stitch placement and size just right. 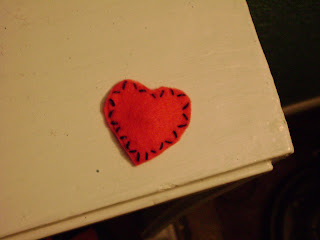 That being said, a little hand stitching can really jazz a simple project up. 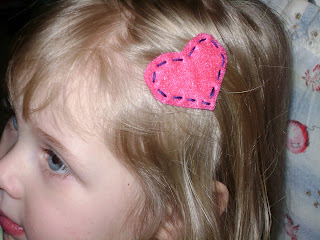 I've been planning on making felt hairclips for Maddy since before Christmas. I just now got around to my first attempt, and I only bothered because I completely bombed another project that was almost done...I needed something to be able to end on a good note. Nothing grand, I might take it all apart and try something a little different, but right now Maddy loves them. And she HATES having things in her hair!